A solo exhibition by the New York-based artist features a range of new and recent works as well as a site-specific installation that integrates the building's unique architecture. 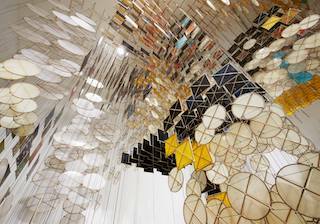 SITE Santa Fe presents a solo exhibition by New York-based artist Jacob Hashimoto from October 5, 2018 – March 24, 2019. This exhibition features a range of new and recent works as well as a site-specific installation that integrates SITElab’s unique architecture. The exhibition, entitled The Dark Isn’t The Thing To Worry About, explores the balance of the natural world, and Hashimoto’s longtime fascination with the intersections of painting and sculpture, abstraction and landscape. Exploring these intersections, Hashimoto creates distinctive works comprising hundreds of bamboo and paper elements strung together and suspended, forming complex layered compositions.His accretive works reference video games, virtual environments, and cosmology, while remaining deeply rooted in art-historical traditions, notably landscape-based abstraction, modernism, and handcraft.